Say HELLO to the HALO at Artisan Plastic Surgery! Say HELLO to HALO at Artisan Plastic Surgery! Looking to prolong your summer glow while also diminishing the signs of aging and sun damage? Now you can at Artisan Plastic Surgery! We are thrilled to announce that we are now offering the Halo laser which gives our patients beautiful results without the downtime often associated with traditional, ablative lasers. 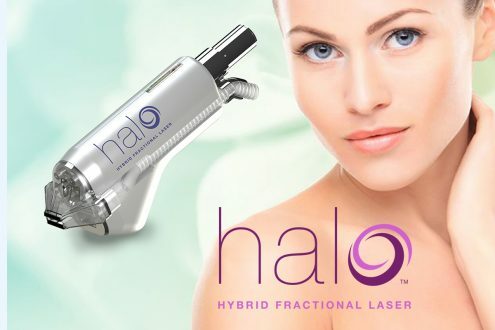 The first of its kind, the Halo laser is the only hybrid fractional laser in the world, and it is now within your reach! What is so unique about a hybrid laser? With one single pass over the skin, the laser simultaneously delivers ablative and non-ablative wavelengths. This laser is highly efficacious in improving signs of aging, such as fine lines and wrinkles, sun damage, enlarged pores, uneven skin tone and texture, and acne scars. What does the Halo Laser feel like? Prior to your procedure, your practitioner will apply a topical anesthetic and integrated cooling technology to reduce feelings of discomfort during your treatment. We are also offering nitrous oxide (laughing gas) to help with any discomfort as well. Most patients report the laser treatment as generally comfortable overall, mainly with feelings of heat and occasional prickling sensations. 15-30 min following the treatment, you will likely experience a lingering, warm sensation on the treated area. Most patients require no downtime following their treatment. Your skin will likely be red, and you may experience some minor swelling. You may also experience some mild tenderness for a few days following the treatment. When can you resume your normal activities? For the first 24 hours, your skin should be protected as directed by your practitioner’s instructions. SPF is a MUST, as always! You can resume your normal activities the following day after treatment. When will you begin to see results? 2-3 days following the treatment, you will begin to notice a light bronzing appearance over the treated area. On day 3 to 4, you will begin to observe your new skin beneath, releasing our youthful, healthy glow! Over time, your skin will continue to improve with the greatest pigment improvement after 2-3 weeks with a dermal regeneration phase that will continue for months to come. With years of experience as a Laser Practitioner, Lauren Bays is an expert at using the Halo Laser. Lauren is the secret behind Atlanta’s most flawless faces, and will customize a treatment plan to fit your specific needs. Are you ready to get your halo glow on? Call us today and make an appointment at 404-851-1998. We look forward to seeing you soon!